Some 150 million years ago in what is now Northern Bavaria, Archaeopteryx, the oldest bird species ever discovered, inhabited a subtropical environment characterized by reef islands and lagoons set in a shallow sea that was part of the primordial Mediterranean. All the specimens of Archaeopteryx so far recovered were found in the valley of the Altmühl River, in geological settings that represent this habitat—the Jurassic Solnhofen Archipelago. The latest find was made there in 2010, and this new specimen has now been analyzed by a team of researchers led by LMU paleontologist Oliver Rauhut, a professor in the Department of Earth and Environmental Sciences who is also affiliated with the Bavarian State Collections for Paleontology and Geology in Munich. 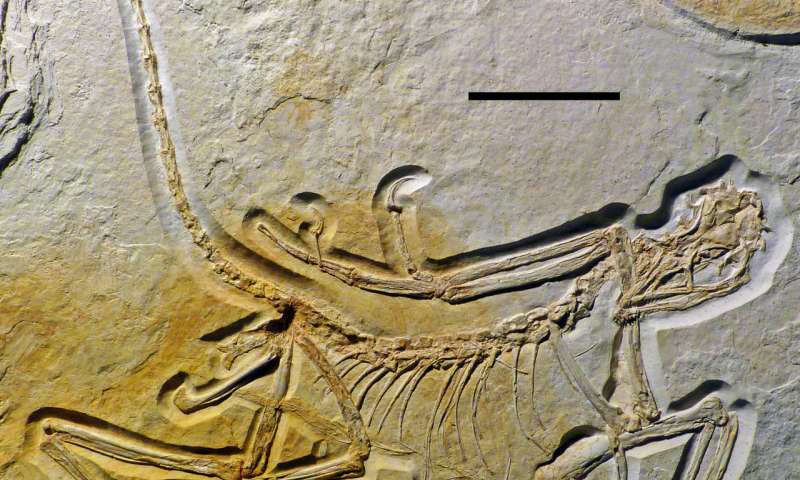 Stratigraphic analysis of the find locality reveals that the fossil is the oldest known representative of the genus Archaeopteryx. "Specimens of Archaeopteryx are now known from three distinct rock units, which together cover a period of approximately 1 million years," Rauhut explains. Notably, the oldest example exhibits features that were not observed in the other specimens. "Among other things, they reveal that Archaeopteryx was very similar to advanced predatory dinosaurs in many respects," says Rauhut. Moreover, in the new study, he and his colleagues provide a diagnosis that reliably distinguishes Archaeopteryx from its closest relatives, both non-avialan theropod dinosaurs and basal birds. This key will be very valuable, as a whole series of bird-like predatory dinosaurs has been described in recent years, mainly from China, which has greatly complicated the taxonomic classification of the group. The new specimen is the 12th fossil to be attributed to the genus. However, in a study published in the online journal BMC Evolutionary Biology last year, Rauhut's group reported that the first of these to come to light—the so-called Haarlem specimen discovered in 1861—does not actually belong to the group. This result thus reduces the number of Archaeopteryx fossils to 11, although some doubts remain concerning the assignment of two of these. This underlines the necessity for a diagnosis to clearly identify Archaeopteryx. Moreover, the investigation of the 11th specimen demonstrates that the known specimens span a remarkable range of anatomical variation. Potential explanations for the broad spectrum of variation extend from intraspecific developmental polymorphism to evolutionary differentiation, i.e., the possibility that the fossil material so far recovered represents more than one species. "The high degree of variation in the teeth is particularly striking—none of the specimens shows the same pattern of dentition as any other, which could reflect differences in diet," Rauhut says. "This is very reminiscent of the famous case of Darwin's finks on the Galapagos, which show remarkable variation in their beak shapes. It is even conceivable that this primeval bird genus might, in a similar fashion, have diversified into several specialized forms on the islands of the Solnhofener Archipelago. In that case, the Archaeopteryx fossils could represent a species flock, a Jurassic analog of Darwin's finches."